Dessert oysters? 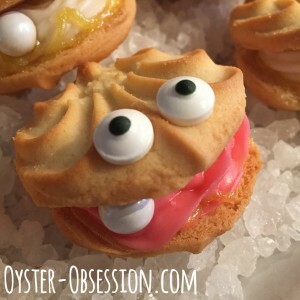 Several friends pointed out vanilla-wafer oyster cookies to me, and there have even been some posted on the Oyster Obsession Facebook page. I thought they were cute and could be fun to decorate with my nieces and nephews, but I’m not a fan of vanilla wafers. Then I saw Pepperidge Farm’s lemon cookies! They look like little oyster shells and they taste good. We decorated a batch and fell in love! They are easy enough for kids and showy enough to impress the grown ups. Lemon oyster cookies with pink frosting filling and sixlet pearl. 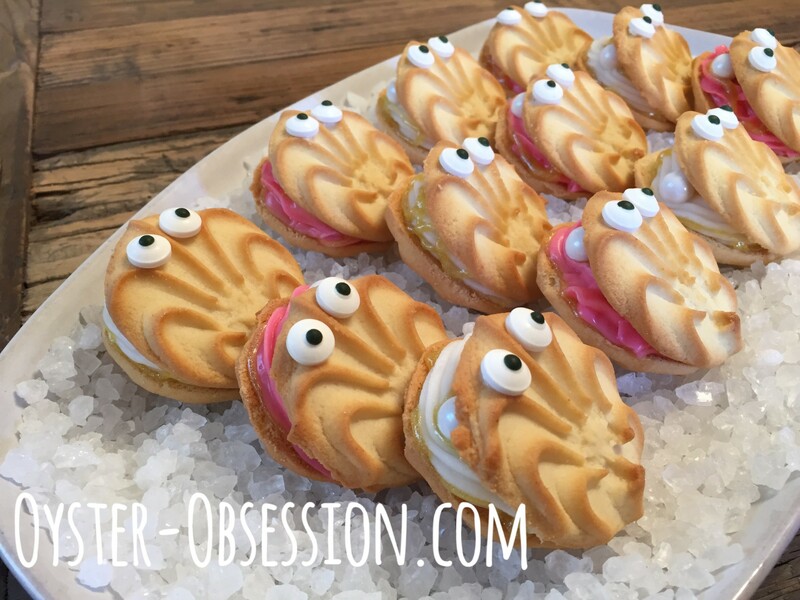 Start by squeezing frosting (we used white and pink) onto a lemon cookie. Make a bigger blob at the back to help hold the oyster open. A star tip makes the frosting look like gills! Since a good, fresh oyster is wet and glistening, add a ring (or some swirls) of sparkle gel around the frosting. Stick a sixlet pearl in the edge of the frosting, where it can be seen once the top shell is added. Place a second cookie on top and gently press it down at the back “hinge.” The blob of frosting and the pearl should hold the shell open at the front. 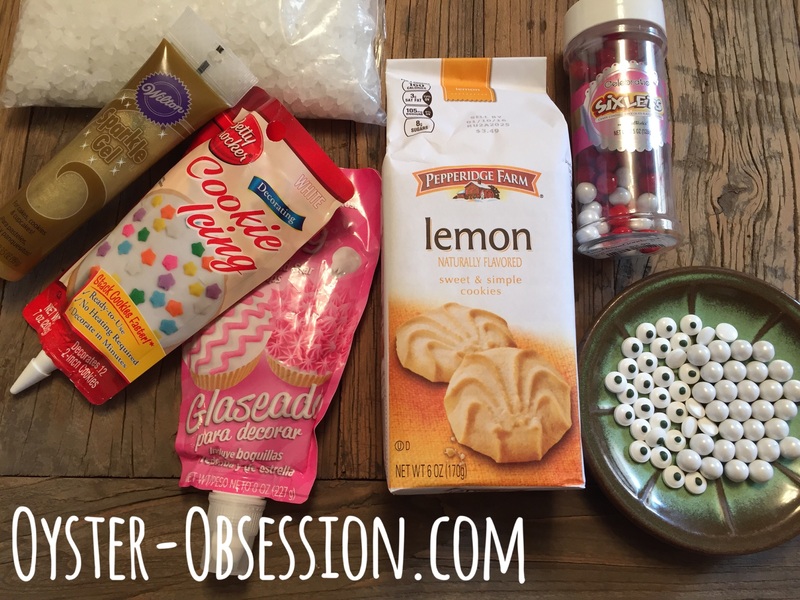 Use small dots of white frosting to stick candy eyes to the top of the shell. 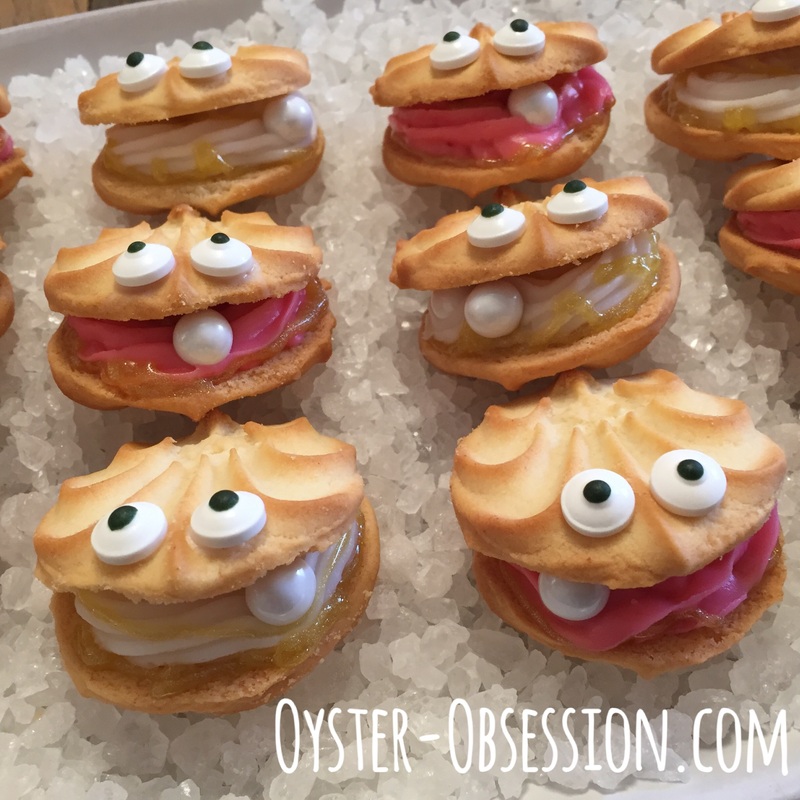 Lemon oyster cookies with sixlet pearls.